The Chicago Water Tower, one of the only public buildings in the burn area to survive the fire. Myth: The Great Chicago Fire was started by a cow. The Great Chicago Fire destroyed 3.3 square miles of Chicago, Illinois, burning for two days in 1871—between October 8th and October 10th. It killed hundreds of people, left more than 100,000 homeless (nearly one third of Chicago’s residents at the time), destroyed roughly 17,000 buildings, and caused a couple hundred million of dollars in damage (about $4-$5 billion today). It may come as a disappoint to some to learn that the cow story isn’t true—the man who wrote the O’Leary story for the Chicago Republican, Michael Ahern, later admitted that he had made the cow angle up in order to create a more interesting tale. But the fire certainly did start in the vicinity of a barn owned by the O’Learys. However, the exact cause of the fire was never determined, though Catherine O’Leary was used as a scapegoat of sorts. O’Leary was an Irish Catholic immigrant—despised by many people at the time—so she made an easy target. In addition to Ahern’s retraction of his cow story, the O’Learys claimed to have been asleep by the time the fire started, so there would have been no lantern in the barn for a cow to kick. There has been a lot of speculation about the cause of the fire, but, as stated, little is known for certain. One of the other popular theories that is also likely false is that the fire was caused by a meteor shower- specifically, the theory goes that it was caused by fragments from the broken up Beila’s Comet. (Incidentally, about a year later, on November 27, 1872, fragments from Beila’s Comet resulted in a meteor shower that had an astounding 3,000 meteors per hour visible!) Three other large fires started around Lake Michigan on the same day, which some people argue is too much of a coincidence not to have a common cause. However, meteorites that actually make it to the ground are usually cool when they hit and thus generally don’t start fires. (One did once strike a woman while she was napping in her living room making her the first known person to be struck by an extraterrestrial object, but it wasn’t hot.) Further, given the prevalence of flames at night and the extremely dry and windy conditions at the time, it’s thought by most historians that the other fires were merely coincidence and not from a common source like a meteor shower. Despite not knowing the exact cause of the Chicago fire, it is easy to see just how the fire spread once it started. Chicago in 1871 was not like the skyscrapers-and-concrete Chicago that we know today. Around two-thirds of the buildings in Chicago were made of wood at the time. Most of the buildings had tar or shingle roofs, which would only serve to feed the flames. The roads and sidewalks were also made from wood products. The conditions were dry, with a drought plaguing the city not long before the fire started—that summer, they received only about a quarter of their average rainfall. And let’s not forget Chicago’s nickname: it isn’t called “the Windy City” for nothing. At the time, it’s believed that a strong south-westerly wind blew hot embers from the fire toward the heart of the city, landing on the highly flammable roofs and starting up additional fires. Another big issue was that the people did not act quickly enough. The fire department was alerted to the growing problem around forty minutes after the fire started, after an alarm was pulled in a pharmacy. People didn’t realize how fast the fire would spread due to the bad conditions. The fire finally went out when the winds died down and a light drizzle helped the fire fighters with their efforts. 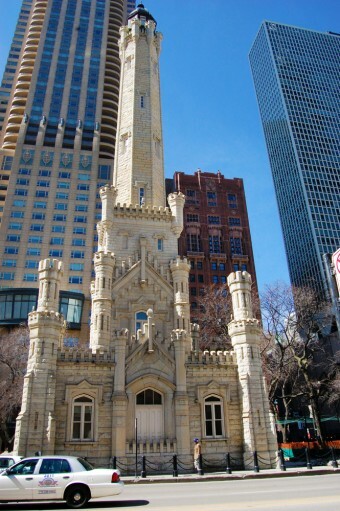 Only three large buildings in the affected area survived enough to be repaired: the Chicago Water Tower, St. Michael’s Church, and the Chicago Avenue Pumping Station. The latter two only had their exterior walls to rebuild from, as their insides were eaten away by the fire. In the aftermath, Chicago received donations of money, food, clothing, and other supplies from cities across the United States to help them rebuild. Surprisingly, much of Chicago’s infrastructure—such as mass transportation—remained intact. The fire had destroyed nearly 73 miles of road, but it hadn’t touched the harbors. Railroad tracks were also largely undamaged, which allowed so many of the donated goods to pour in. After the fire, legislation was passed requiring buildings to be constructed from brick, stone, and other fireproof materials. It wasn’t fully effective because most of the poorer residents couldn’t afford the materials or the skilled labourers required to rebuild. In addition, some businesses simply ignored the laws to save money. Ironically, it was Chicago’s fiery destruction which led to it becoming one of the United States’ most important economic cities, as well as one of the most populous. The rebuilding effort required an army of people to be hired as labourers, which boosted both the economy and population of the city. At the time of the fire in 1871, Chicago boasted about 300,000 residents. By 1890, Chicago was home to over a million people, making it second in population only to New York City. Funny enough, the winds changed in time to save the O’Learys’ house. Their barn went up in flames, but their house wasn’t touched by the fire. A new Chicago Fire Academy was built in 1956 on the site of the O’Learys’ burnt-down barn. It is still in operation today. In contrast to the Chicago fire actually helping Chicago become one of the major cities in the United States, the 1906 San Francisco earthquake that resulted in about 80% of the city destroyed ended up ending San Francisco’s reign as the dominate city in California, with a large percentage of the residents moving to Los Angeles. A large amount of timber used to rebuild Chicago came from Singapore, Michigan, and led to extreme deforestation. Without the trees to protect the town from the elements, sand blew in from Lake Michigan’s shoreline and eroded the town in just four years. It is still one of Michigan’s ghost towns and lies beneath the sand dunes on the shore of the lake. Though a majority of buildings in Chicago were made of wood, many designers would attempt to disguise the fact by making the wood look like a different material, thus more aesthetically appealing. The donations that originated from all across the United States served as a sign to some that any wounds left over from the Civil War had been healed, and the nation had become whole once more. “At the time of the fire in 1971, Chicago boasted about 300,000 residents”…..??? Check your facts. The “Windy City” name has nothing to do with weather. It came about during Chicago’s vying for the Columbian Exposition of 1892-1893. It was name bestowed upon it by New York due to it’s boastfulness. Funny, just last week I read Susan Wiggs “The Mistress” (book two of The Chicago Fire Trilogy books) and she based her story on the O’Leary daughter finding in love during the fire.. And today I read this! The Chicago Fire was a big deal because it was Chicago…but the real fire that day was in Peshtigo, WI. That fire destroyed an area of forest nearly twice the size of Rhode Island. No one knows about it because of the Chicago fire, but it was far more destructive and massive. Thanks for busting the myth of blaming the O’Leary’s. Catherine O’Leary was just a poor scapegoat picked by the yellow press. I’d not heard the meteor theory before. Have heard a neighbor named Peg Leg Sullivan being blamed, but he was just the first to yell FIRE! Did a lot of research for my novel ‘Firebrands.’ Personally believe the theory it was another neighbor stealing milk, which I suppose makes the cow an accomplice after all. More at my website if interested paulwandrews.wordpress.com. the cow did not do it a guy named sullivan did it by dropping a pipe on hay. The fire was in 1871, not 1971. @RoseThePuppet: Does it say 1971 somewhere? I’m not seeing it… Thanks! Wow. This article was very interesting. I had always thought a cow had did it. Never trust the internet. Thank you.